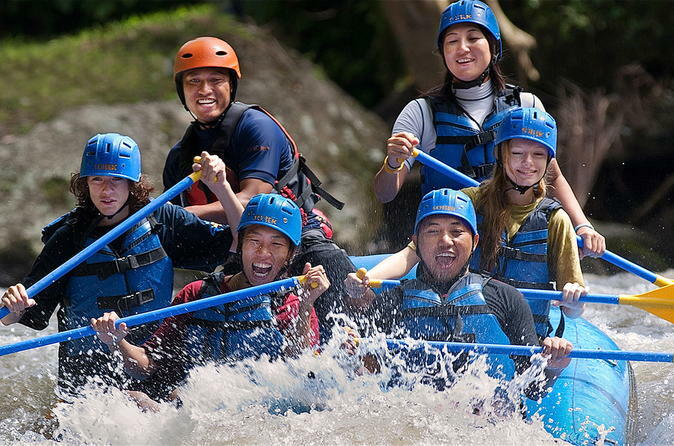 Safe, family friendly white water rafting on the Ayung River in Bali. This fun adventure activity for guests of all ages is a mix of wild excitement, breath taking views and well-guided, informative, sightseeing. Trip includes round-trip transport from your Bali hotel, Lunch and insurance. Join us on this two-hour, visually spectacular rafting trip down the Ayung River is made even more enjoyable by the secure feeling of using the safest rafting company available for your trip. This adventure for guests of all ages is a mix of wild excitement, breath taking views and well-guided, informative, sightseeing. On the more leisurely stretches through tropical forests you will see Hindu shrines that are brightly decorated on ceremonial days of prayer. Our well-trained guides and welcoming operational staff, make your trip the most memorable and enjoyable trip possible.